Cloud mining : what are the risks and how to minimize them? Cloud mining enables users to mine bitcoins or other cryptocurrencies without managing the hardware. This page is dedicated to the analysis of the risks related to this practice and for each one of those tisks I am going to give you a few hints that will teach you how to minimize them. Note that this article is part of the series "Cloud mining: the ultimate guide", I recommend you to read the whole guide before investing. In fact, it is not reasonnable to spend any money on cloud mining unless you are well-informed about the risks and the potential benefits of your decision, otherwise you might just end up mismanaging your assets. The vast majority of cloud mining services that you can find online are actually scams. They use a fraudulent investment operation called "Ponzi scheme", which consists of paying the old investors with the funds given by new investors. At some point this scheme stops working, this means that the service providers run out of money and have to shut down their cloud mining website. This is unfortunate because if you paid with a cryptocurrency, there is nothing you can do to recover your investment. If there is no video/image of the actual mining facility, this is a strong indication that the service might be a scam. Avoid cloud mining services that have not been running for at least a year. Only consider companies that are trusted by the community and offer a reasonable pricing. If you want to have a good example of a reasonable price range, I recommend you to visit the Genesis mining website. If there is no "team", "about us" or "customer service" page, this might be a little bit worrying. Avoid paying with cryptocurrency as there is no way to recover your investment if something goes wrong. As I said on my article "how to evaluate the profitability of a cloud mining investment", it is impossible to predict what the return on your cloud mining investment is going to be. In fact, while your cloud mining contract provides you a computing power that is constant, the difficulty of mining may or may not increase over time. This means the number of coins you mine can decrease over time. This is an uncertainty you should take into account before buying a cloud mining service. A good way to minimize the risk linked to the variation of mining difficulty is to favor short term contracts over long term contracts. Another way to mitigate this effect is to mine different coins: do not put all your eggs in one basket. You have probably already noticed that the cryptocurrency market is very volatile. Indeed, the market capitalization of a cryptocurrency can be multiplied or divided by a factor of 2 in a few days. This means the value of your coins may decrease substantially in a matter of hours. Knowing that most cloud mining services pay you directly with the currency you mined, it seems reasonable to diversify your assets as soon as you receive them in order to minimize the shot term risks linked to volatily. If a "mining free" exchange protocol is being implemented by the community, this could put your cloud mining operations at risks. This is why you should make sure there is not going to be a major modification of exchange protocol during the course of your contract. Keep in mind that even though such changes are rare occurrences, they are theoretically possible and could be extremely damaging. Some contracts are more flexible than others. For example, some contracts restrict you to mining only one cryptocurrency while other contracts allow you to switch between different coins. Your mining operation may have a well-defined lifetime or it may cease depending on the price of the cryptocurrency you are mining. Do not forget to take into account the electricity and management cost (cloud mining services do not always display them on their pricing page). Investing in cloud mining is a pretty risky operation. However, if you consider all the risks exposed in this article, minimize them using the hints I gave you, this investment may be a wise decision. If you want to learn more about the other side of the coin, I invite you to read this article about the benefits of cloud mining. The story behind this piece of art is really interesting. 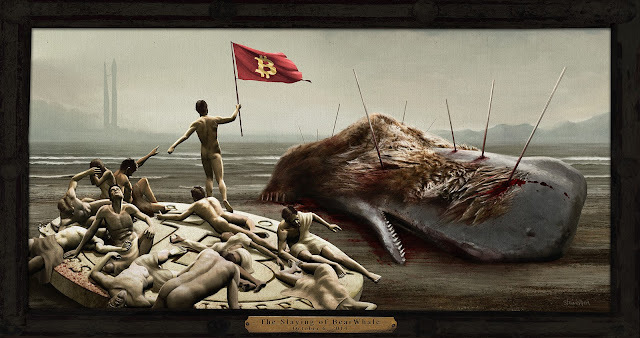 The so called BearWhale hold about 2000 Bitcoins at the end of 2013. Selling most of them, he rode Bitcoin’s price all the way down to $350, losing over two-thirds of his wealth. Those epic transactions can be viewed here. The irony is that"the last Bitcoin supper" was sold on Ebay for 2900 US dollars (see the auction here). Bitconnect is an interesting concept - it is a platform where people can invest their cryptocurrencies and earn interest on investment. There is nothing wrong with this idea, it could work on paper. However, if you take a closer look at what is really happening in this particular case, you can see that there are big red flags everywhere. This website is not financial advice. I recommend you to see a financial advisor before investing in cryptocurrency mining.